Until now, we have created many processes using Process Builder. It is an easy and fun experience to create processes. These processes will execute as soon as they meet a set criteria. There are some situations, however, when a business may want to bypass a process! Pamela Kline is working as System administrator at Universal Containers. She has developed a Process (Getting Started with Process Builder – Part 42 (Auto remove a record from Chatter Groups) to auto post Opportunity details to the UC Internal Announcement Chatter group whenever an Opportunity gets created with an amount greater than $ 100,000; and also, when a related user, Opportunity Approver (Custom field), is @ mentioned in that post. Pamela has now received a requirement to bypass this process for the system administrator. A system administrator usually creates hundreds of Opportunity every week. And therefore, business users want to avoid too many Chatter Feed generated by the Process that we created in Series 47. But what happens, if the business comes back after few weeks and requests Pamela to bypass a Process for one more profile and one more user (belonging to a different profile). If this happens, it would create a headache for Pamela – how many times is she going to modify a process to bypass it for different profiles or users? As if this was not bad enough, let us suppose that after a few months again, Pamela gets yet another requirement to bypass the process for a few more users who belong to different profiles – What a nightmare! Let us bypass this scary scenario itself! And, let us learn how to use custom permission with Process Builder. Now you can modify the process as per the business requirement. We will add one condition to our process to check whether the user has access to Skip process builder custom permission or not. From now onwards, if an Opportunity gets created with amount more than 100K, then the process will post a message to Chatter Group UC Internal Announcement. This process will only work when an Opportunity is created by users whose profile does not equal the system administrator (because we have assigned a custom permission to these profiles). If you want to bypass a process for a single user, then consider using a permission set instead of using the profile. Hi Rakesh, where do you actually define that it bypasses Process Builder in this example? I only see a label and name ‘skip process builder’ in screenshot from step 1, that wouldn’t do it just by itself would it? Are you using Apex on the background somewhere? 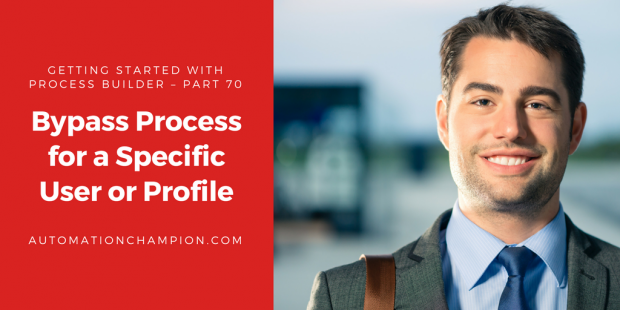 I have used Custom Permission to bypass process for specific profile. Thanks for the post. Perfect example to understand Custom Permissions.